MODERATION, WITH CHEESE You can have it all—just not all the time. I had a doctor friend years ago who hyped me to the secret portent of the expression "Everything in moderation." Most people, he would say, focus on the moderation part, as a warning about the dangers of excessive consumption—but almost nobody tunes into the positive, permissive message that's also embedded in the maxim: If you can swing the moderation part of the deal, then you can have everything. I mentioned this to my doctor recently, and he thought it would make a great bumper sticker. Our discussion centered on a glass of wine now and again, but the notion extends to everything and includes such things as the occasional bag of nasty corporate potato chips. Well, maybe not everything, since you don't hear much talk about moderate heroin users. Just a taste for me, thanks. I don't think so. 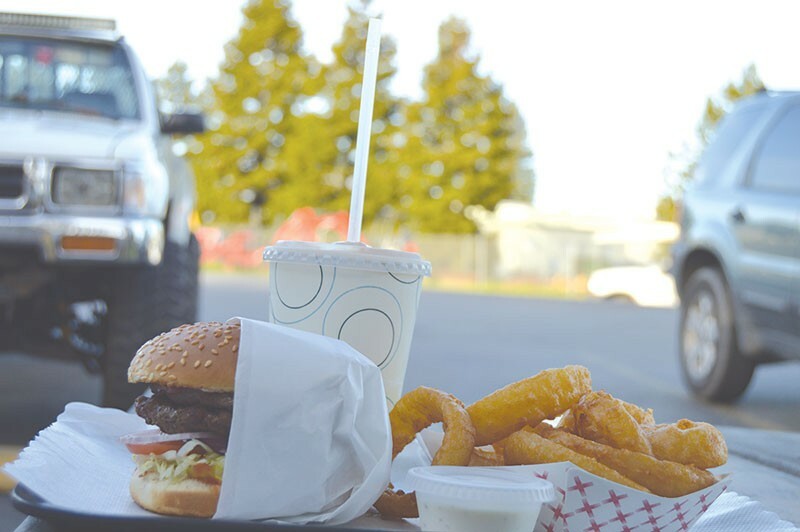 But when it comes to the simple pleasures of a roadside hamburger shack, exemplified by Sequoia Burgers on the outskirts of Sebastopol, it's totally apt, and Sequoia gives you ample opportunity to explore your inner moderate. I'm not saying you should vote for Hillary Clinton—only that a moderate hike in rich people's taxes will deliver everything that Bernie Sanders promises, with fries. Sequoia is to Bernie Sanders what the French Laundry is to Hillary. Both have their place; the difference is whether you're going to spend a few bucks or a few hundred bucks for dinner. This old burger shack has been here for decades, and is what you'd expect of it, nothing more, nothing less. It is scrappy perfection: a menu heavy on the hamburger, the fries, the onion rings and top-notch milkshakes concocted from real ice cream. For décor, a couple of tables out front under an umbrella, a bunch of semi-outdoor seating options in the back. A bench on which to wait for your order. Flames on the grill and a superhero mascot dressed in red and white with a hamburger head. It's awesome. The Sequoia burger ($6.99) gives an opportunity to roll with the moderation—or to be a disgusting pig at the trough of your own disordered devise. Diners at the step-up-and-order window have a choice: single, double or triple hamburger patty. The single appears to be a bit scant and could get lost amid a veritable pasture of shredded lettuce planted on the big, ensconcing bun. The triple, that's totally immoderate and might be linked to the word "bypass" if you have too many of them. And so the double patty it is. The double's perfect portion of beef syncs nicely with the slathery fixings—the mayo, mustard, ketchup, pickles, onions and tomatoes. Here's a thought: Sit outside with your plastic platter on a warm evening and watch the traffic zoom by on Highway 116. Feral Cheryl and her boyfriend might be at the adjoining picnic table, stoned off their butts and contemplating a corn dog with a wide-eyed wonder usually reserved for the northern lights. Very entertaining. Look, there goes a Korbel Champagne pickup truck on 116, hinting at the totes luxury that lies beyond and around this most simple of burger joints, with all its prosaic pleasures. Order a small portion of the onion rings ($3.99) and leave a few on your plate. Them things will kill you. Consider taking a pass on the Ranch dressing offered with rings; I found it to be weirdly tangy—I think it's supposed to be garlicky. As for the fries ($4.25), I've seen the pictures and I've read the Yelp reviews. At Sequoia Burger, to order the large fries is to order the invasion of Iran: an impossible and foolhardy task fraught with peril—of overextension, of the immoderate temptation to belly-bomb yourself into oblivion in defense of Western gluttony. There are also garlic fries. The true test of a burger-and-shake experience is, how do you feel in the morning? Or, 20 minutes after you get back in the car and hit the road? Do you hate yourself? At Sequoia, while the threat of a burger-and-shake belly-bomb is always at hand, if you order wisely, order moderately, you'll have no regrets. I felt clean and energized after wolfing back the burger and a chocolate milkshake ($4.75), no greasy-spoon hangover, no slobbering meat coma halfway out of Petaluma. For those of a truly moderate, if not vegetarian persuasion, there's a quartet of lighter-fare menu options that include a turkey burger ($6.50), a fishwich ($6.50), a garden burger ($6.50) and a bunless deal presented as the low-carb burger ($6.99). Or try the Sequoia chicken sandwich ($7.50) and say hello to some avocado and bacon as you say goodbye to all that talk about moderation and commune with your inner fatso.